It strikes me as a measure of Outbound Flight's badness that I misquoted its title as Outbound Project. Was it called "Outbound Project" in-universe? I can't help but think I got "Project" into the name from somewhere. EDIT: Meriba, hurry up and include Jedha and Scarif into your map! We're waiting on ya! Well, two out of three isn't bad. How odd that Eadu is not on that map. The fact that there would be such a planet was revealed somewhere back in September. 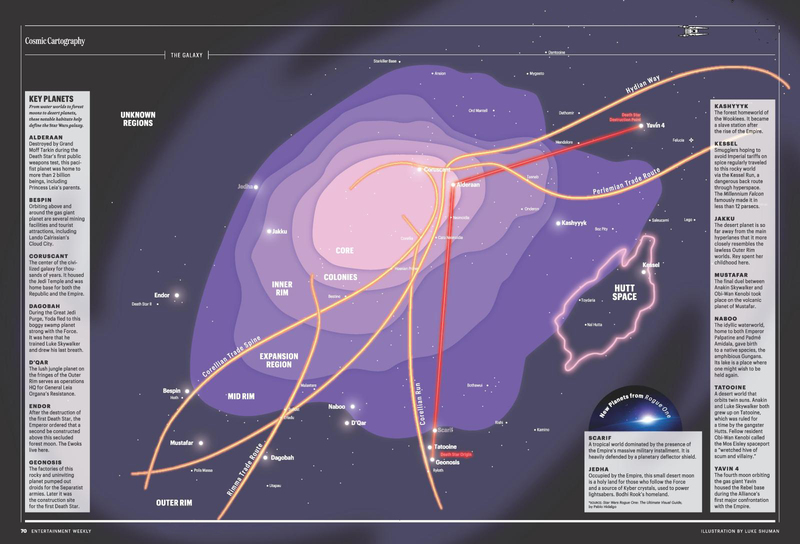 Another odd thing about that map is that there is no red line path from Geonosis (or wherever the Empire moved the Death Star to after sterilizing Geonosis) to Jedha and from Jedha to Scarif. After all, the Death Star obliterated Jedha City before going to Scarif. So that's two things wrong with this map. Meriba, just FYI, I found another error on your map. In grid N-11 in the Colonies Region, on the Quellor Run south of Cato Nemoidia and north of Vladet, there are two planets both named Chorax. One of these must be mislabeled, I suspect. Jedha and Scarif are included... and Chorax changed by Hensara. There's a label for Scarif, but no new planet denoting it. Pii, Austan and Utaruun are all still there, but there's no new dark blue circle for Scarif. Yes, there is no dot denoting Scarif. I have considered (maybe I am wrong) that Scarif is somewhere between Pii and Austan. The practice to reference two systems with only one dot is common in the map (see Geonosis and Tatooine). In this case it should be Geonosis and Tatoo (Tatooine is not a system), but not everyone knows that. So, It is more easy to indicate Geonosis and Tatooine. In any case, thank you for the criticisms. True enough, but in the case of Tatooine and Geonosis, they're only a parsec away from each other. Another example might be Rishi and Kamino. Perhaps there are others on the map that I don't know of. But in each case, the two planets are on the same margin line so we know which two planets are in the "same" place. But Scarif isn't aligned with any of the other planet labels in the Arkanis Sector so the word "Scarif" is just a free floating label that doesn't tell us where Scarif is among its neighboring planets. That's kinda silly for a map because maps are made to tell us where things are. Ok, now we have official locations for all of the planets of Rogue One! Lah'mu, the Ring of Kafrene, heck even Wobani where Jyn Erso was held at that prison camp are all there! That's great. Thanks for sharing this. Indeed, it was really nice to see Jedha's location explained in that article. What I thought was part of the Unknown Regions was actually an extension of the Mid-Rim Freestanding Subsectors, which I thought only jutted slightly into the Galactic West, rather than extending all the way around the West. Yeah, this ain't your daddy's Legend Galaxy no more, youngin'. So, as was discussed earlier on this thread, it looks more and more that, in canon anyway, the Unknown Regions only covers the Western Outer Rim. Even so, (and as was also mentioned earlier) that's still plenty of room for the First Order to run around in. "A wizard is never late, Frodo Baggins! Nor is he early! He arrives precisely when he means to!" After just purchasing the Last Jedi Visual Dictionary, I saw that there's an updated map on pages 8-9 that has the locations of the planets in TLJ: Cantonica, D'Qar, Chait and Ahch-to. Ahch-to is in the West, pretty deep in the Unknown Regions (as we saw in BB-8's holographic map in TFA). D'Qar and Chait are relatively close together in the South-Southeast Outer Rim. As for Cantonica, as it was described as a "casino planet" populated by high-class galactic citizens, I expected it to be somewhere in the Core Worlds. As it turns out, Cantonica is located in the Corporate Sector, all the way at the end of the Hydian Way. I think this is yet again another example of just how fast it's possible to travel from one side of the GFFA to the other. Apparently, the events of TLJ take place in less than a day. I recall a mention somewhere that TLJ takes place over the course of just 18 hours. This means that a plot point in TLJ (that I'm NOT going to spoil here) which involves traveling from Chait to Cantonica and back within the time frame of TLJ (just 18 hours) proves that it's possible to travel from one side of the GFFA to the other and back in less time than it would take to drive across the United States. Just try and wrap your mind around just how fast you'd have to be traveling to cover a distance of roughly 120,000 light-years in less than a day. Star Wars.com hasn't yet published a "Where in the galaxy are the worlds of The Last Jedi" yet, but it's still early. I expect (and hope) that such an article gets published sometime in January 2018. This may have been an exaggeration, but the films also show quick travel to many points throughout, such as Rey and Chewie heading to Ahch-to at the end if The Force Awakens. Of course, this could just be moving the plot along quicker.